METZ CONNECT has developed a single pole spring clamp terminal block specifically aimed at compact and low profile devices. As a single pole connector solution and also its compact size, SM/SR99 allows design engineers to take a flexible approach to connector placement on a PCB with the very limited space that is often available to them. At 6.6mm in height and 5.8mm wide, the product carries a very small PCB footprint and can be placed on the circuit board in any number of orientations. Accepting solid core and stranded cables 0.2sqmm - 1.5sqmm and rated up to 9A, SM/SR99 features a finger operated actuator that not only allows for quick and easy wiring but also enables the operator to make multiple connect and disconnect cycles should they require. Once the cable is inserted, the operator will find an inspection window on the top side of the housing and a quick visual check can be made. Next to the inspection window the operator will then find a continuity test point to ensure that a quick, safe, and reliable connection has been made. 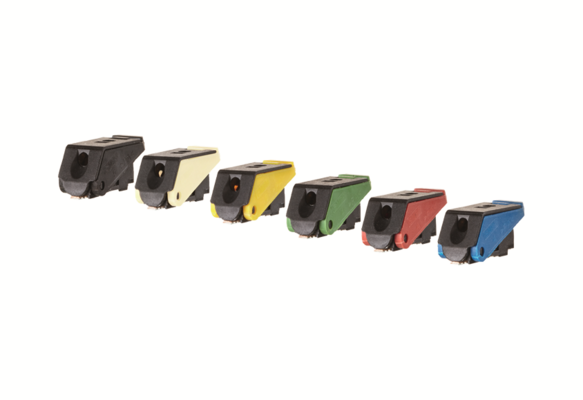 SM99/SR99 is also offered with different colour actuators for additional colour coding benefits. The single spring clamp terminal blocks in SMT and THR versions are available in bulk packaging or on tape & reel.